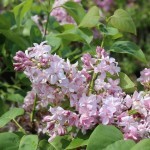 Very cold hardy selection with highly fragrant clear pink flowers. It blooms in late spring to early summer. The flowers are held at tips of the branches and attract butterflies. Prune right after blooming. It does best in full sun in a well-drained soil.